Is Haiti Ready for Hurricane Season? Before he announced on August 5 that he was running for President of Haiti, Wyclef Jean was still listing his age as only 37 years old. But after declaring himself a presidential candidate, the Haitian-American hip-hop star also decided to come clean and confirm that he was really 40. Late Friday night  when Haitian election officials ruled, after days of tense delay, that Jean was not eligible to be President  he got a chance to show the world that stepping into the political arena these past two weeks had perhaps matured him in other, more important ways. After Haiti's Provisional Electoral Council (CEP) announced that Jean did not qualify as a candidate for the Nov. 28 presidential election, presumably because he had failed to meet the Constitution's residency requirements, he could have played the angry rapper wronged. Jean had already gone into hiding in Port-au-Prince this week because, he claimed, he'd received death threats from Haitians opposed to his candidacy. Thousands of his supporters, especially in Port-au-Prince slums like Cite Soleil, said that if his candidacy were rejected they were poised to riot  the last thing anyone wanted to see in Haiti, which is still reeling from the massive Jan. 12 earthquake that killed more than 200,000 people. But even if Jean can't run for President in November, he at least acted presidential Friday night. "Though I disagree with the [CEP's] ruling," he said in a statement, "I respectfully accept the committee's final decision, and I urge my supporters to do the same. We must all honor the memories of those we've lost  whether in the earthquake or at any time  by responding peacefully and responsibly to this disappointment." Jean's platform priorities, such as jumpstarting the country's barren agricultural sector via new rural villages or expanding its virtually non-existent public education system, still deserve an ample hearing among the country's political establishment  as does his demand that the elite stop shutting the Haitian diaspora out of the nation's civic and economic life. "At least attempting a presidential candidacy has given him a bully pulpit," his brother and spokesman Sam Jean told TIME, "and I don't see how it can't help him further these causes now." The CEP decision wasn't all that great a surprise. The Constitution requires that a presidential candidate reside in Haiti for five consecutive years before the election. Lawyers for Jean, who was born in Haiti but left to live in New York with his family when he was nine years old, had originally argued that his childhood years in Haiti could satisfy that criterion; but election officials insisted the rule meant the five years immediately preceding the election. Jean, who never took U.S. citizenship and still carries his Haitian passport, also pointed out that he and his Haitian-American wife Claudinette have owned residential property in Haiti for at least the past five years. But in the end he apparently couldn't convince the council that he'd lived in-country continuously enough to pass the constitutional muster. There were also serious questions about his readiness to be President. Despite his obvious commitment to Haiti  Preval made him a goodwill ambassador in 2007 because of his charitable and cultural work for the nation, the western hemisphere's poorest  he had come under come under negative scrutiny for the often dysfunctional management of his Yele Haiti Foundation. Others doubted that a hip-hop performer with no prior political experience could step that easily into the role of head of state. 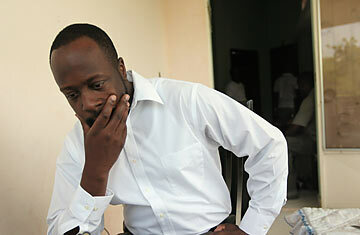 "The Haitian people love Wyclef, but the situation in the country is so bad that we need a serious leader," says Port-au-Prince resident Jerome Chelynde, 33. Still, Jean's brightly lit plunge into Haiti's political waters has turned the world's attention to the country again, which will be critical to prompting the international donor community to deliver the billions of dollars it's pledged to the recovery effort. And Jean stands a good chance of building a candidacy for the next presidential election in 2015, with five years until that vote in which to log the required residency time. If he does qualify, he should get a boost from his popularity among young voters in Haiti, where more than half the population is under age 25. "I told myself that I wouldn't vote for anyone but Wyclef," says 20-year-old Hislome Felix as he stood disappointed beneath wall graffiti in the capital that read "Viv Wyclef," or Long Live Wyclef. "I think he could have been President."